Be the first to share your favorite memory, photo or story of Thomas "Tommy". This memorial page is dedicated for family, friends and future generations to celebrate the life of their loved one. 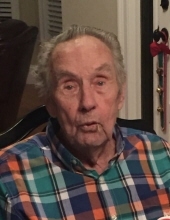 Tommy Thornton, age 90, went home to be with Jesus on January 20th, 2019. He was preceded in death by his parents Rueben W. Thornton and Lula Jones Thornton, twin grandsons Justin Henry Thornton and James Anthony Thornton, sisters Luann Brogdon, Mary Haney, Estelle Weaver, Lula Mae Fowler, Joanna Wallace, Minnie Thornton and brothers, R.W. Thornton and Camp Thornton. He is survived by his wife of 66 years, Patsy Corbin Thornton, sons Mike Thornton (Donna) and Steve Thornton, daughters Teresa Cash (Dwayne) and Lori Brand, Grandchildren, Bambii Crawford, Blake Brand, Meredith Palmer (Nick), Hunter Cash, Lauren Carpenter, Cole Thornton and Matthew Thornton, great grandchildren Kaitlynn Crawford, Cash Palmer, Braxton Palmer, Tanner Carpenter, and Tatum Carpenter. He also survived by several nieces and nephews. He worked in commercial construction for over 40 years in the metro Atlanta area. He was a wonderful husband, loving father, and energetic grandfather. He loved helping family and friends and rarely met a stranger. He enjoyed outdoor activities and telling spectacular stories, some true, some embellished. He graduated from Buford High School in 1948 where he played football, basketball and was on the track team. He was a member of the former New Bethany Baptist Church. The family will receive friends on Tuesday, January 22, 2019, from 4:00 to 8:00 pm at the funeral home. A funeral service will be held on Wednesday, January 23, at 11:00 am, at Crowell Brothers Funeral Homes & Crematory Buford Chapel. Burial will follow at Broadlawn Memorial Gardens. To send flowers or a remembrance gift to the family of Thomas "Tommy" Jefferson Thornton, please visit our Tribute Store. "Email Address" would like to share the life celebration of Thomas "Tommy" Jefferson Thornton. Click on the "link" to go to share a favorite memory or leave a condolence message for the family.